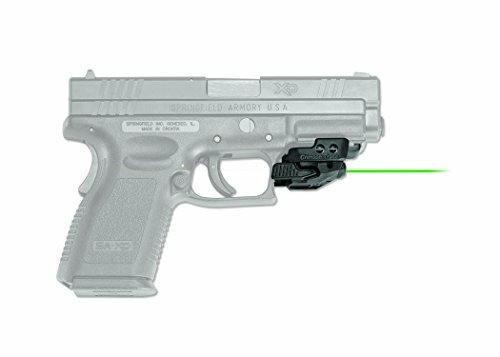 The CMR-206 Rail Master is compact, yet powerful, universal green laser sight designed to fit rail-equipped pistols, rifles and shotguns. The laser sight fits onto virtually any firearm with a modern (M1913 Picatinny or Weaver-style) accessory rail. Ambidextrous control tabs allow the user to instantly activate or deactivate the laser. INSTANT ACTIVATION: Ambidextrous Tap-On / Tap-Off Controls for immediate laser activation from either side of the unit. Includes Constant-On, Momentary, and Strobe laser modes. FITS most pistols, rifles, and shotguns with M1913 Picatinny or similar Accessory Rail & 1-1/16" between the recoil lug and the trigger guard. EASY INSTALLATION: User installed- no gunsmithing required. Four fit inserts are included for specific firearm fit. Factory sighted at 50 feet, but is fully user adjustable for Windage and Elevation with provided tool.